The self adhesive definitive stamps have a phosphor frame which appears pink under ultraviolet light. The last variety under each stamp does not have this border as the stamps were printed at short notice by Southern Colour Print on phosphor coated paper instead. Varieties 419c3 and 419i1 originate from scenic booklets containing two 40 cent Tory Channel stamps - the stamp in row two column one and shown above on the left is printed correctly with 'Tory Channel / Malborough Sounds', the second stamp in row two column three is missing the 'Malborough Sounds' label as shown above on the right. 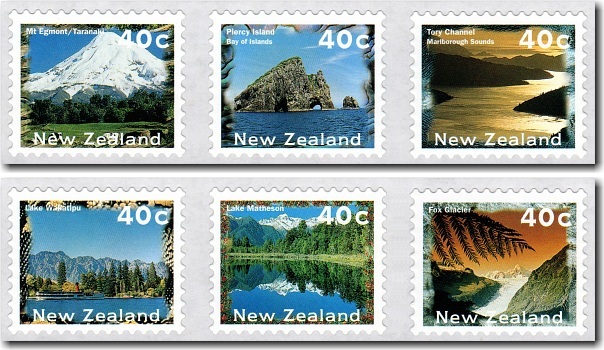 Some catalogues include the 1996 AirPost Booklet stamp, the $1.10 self adhesive 2000 Scenic Definitives stamp and the 10 and 90 cent 2004 Scenic Definitives stamps under this issue.